MoonTides are electrical waves set up in the earth's electric field by the Moon, and to a lesser extent, the other planets. These waves are felt by traders as electrical currents, and trigger emotional buying and selling. Thus they are very useful for timing day trades. They apply to all markets, but are extremely useful in the S&P 500. This chart shows 2 days of the S&P, with MoonTides. The first thing to notice is that there are 2 MoonTides, a positive one shown in green (+Tide), and a negative one, shown in red (-Tide). When the energy from a Moon/planetary event hits the earth's ionosphere, it sends two waves around the earth, one in each direction. As these waves meet at any point, they are of opposite polarity, hence the two waves. These waves create electrical currents that are unconciously felt by traders as emotional swings. Markets are provably about 60 per cent fundamental, and 40 percent emotional. The emotional component is very clear in daytrading. So knowing when the emotional swings are likely to change gives you a trading edge. The second thing to notice about these Tides is that they don't seem to line up with price very well. Look at the red -Tide on 2/8/2002. It starts out OK, but goes higher that price on the first peak. And the green +Tide isn't even close to price. So what's going on here? MoonTides are energy calculations. They don't even know the S&P or any other market exists, except for knowing the date it first traded. No price information is ever used in MoonTide calculations. The only thing that goes into the calucations are the first trade date, a harmonic number, and the date and time. Moontides can therefore be calculated for any point in the future. So when placed on a trading chart, the Tides have to be scaled and shifted vertically. The scaling tends to hold fairly constant, so once found, can be used to guage the potential of a trade. This chart shows just 2/8/2002 with the Tides adjusted. Now look at how well the red -Tide forecast the price action for the first 4.5 hours. It did not forecast the little swings, but it forecast the pattern and the times quite well. This is typical of the MoonTides. The bad news is that prices don't always follow one Tide. The good news is, that when they don't, they usually follow the other Tide. This switching from one Tide to another is called an "inversion." Inversions happen in all chaotic sytems. Markets are provably chaotic, so they have inversions. That's a nasty reality of trading. But think about it. If they didn't have inversions, someone would have cornered the markets and we would have nothing to trade. On this day, there was a sharp move down just after 14:00. That was a clue that an inversion had occurred. Instead of making a high near 14:40, the market was making a low. After that, it followed the green +Tide. The scale changed a bit as well. This particular day happened to be a Friday, and we were doing our live Chaos clinic. 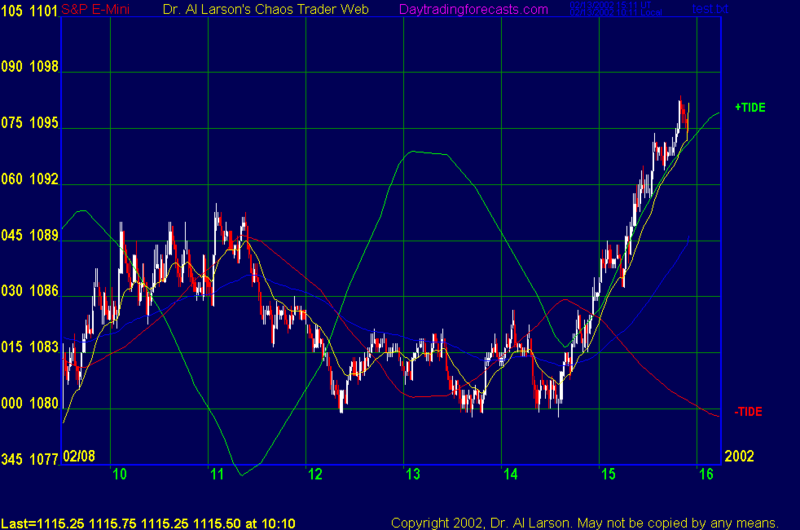 Our 1ADay hotline trade sold the turn just after 11:00, and we caught the inversion and were long on the late rally. So the MoonTides gave us a clear trading edge. By now, you can see that the Tides are useful. They tell you the pattern, get you close to the turns, estimate the extent of a potential gain, and tell you how long a move may last. They are even more useful when coupled with a couple of tracking technical indicators. After much research, we have settled on two simple indicators that even the lamest of trading programs can display-a 110 minute expotential moving average (EXMA) and a 20 minute EXMA. These two indicators are all one needs to see which Tide the market is responding to, and when to enter a trade. I have added them to the chart we saw earlier. The blue line is the 110 minute EXMA, computed on one minute closes. The yellow line is the 20 minute EXMA. Look at the blue 110 EXMA. Notice how its slope tracks the slope of the red -Tide in the morning. Then between 13:30 and 14:30, the 110 EXMA countinued down while the -Tide turned up. So this was a "tracking failure." It gave an early warning that an inversion could be coming. Think about it. A tracking indicator is like looking outside to check the weather before going on that picnic, and not just relying on the weather forecast. Actually, weather systems and markets are both chaotic systems, so forecasting them is equally difficult. They can only be predicted within the bounds of chaos theory, and never perfectly. By using a tracking indicator, we can monitor how well the MoonTide forecast is working. So, a quick way to tell which MoonTide is at work, is to compare the slope of the 110 EXMA to the slope of the two MoonTides. If they match for 30 minutes or so, that Tide is probably the one at work. The 20 EXMA gives you a trade entry and exit tool. First, notice that the yellow 20 EXMA will tend to stay above the blue 110 EXMA during a rally, and below it during a decline. So the 20 EXMA tracks the swings, and the 110 tracks the trend. When the 20 EXMA crosses the 110, it signals a change in trend. Look at the crossing near 11:35. 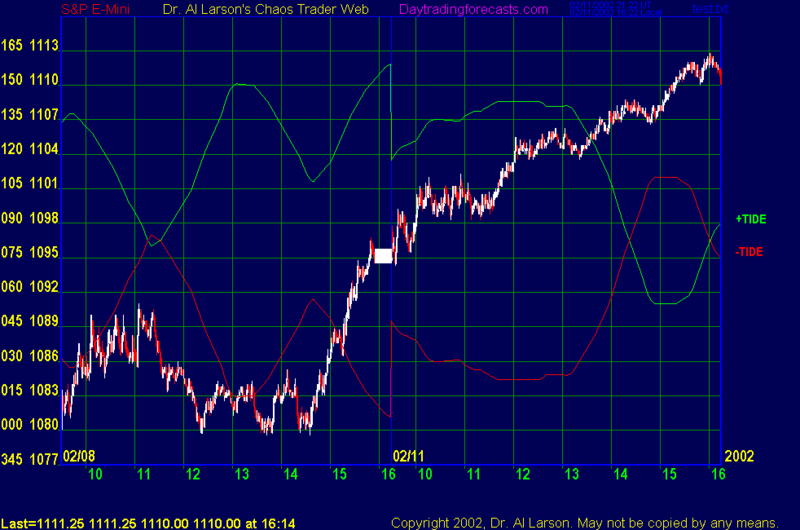 It was a clear sell signal and came close to the forecast MoonTide turn. That's a high probability signal-a good one to take. During a trend move, such as the one from 11:30 to 1:30, notice that the 20 EXMA approached but did not touch the 110, and then separated from it. This picks up the swing congestions, dips of the 20 toward the 110, which can be used to add to a position or to enter an existing trend. On the chart, find the 20 EXMA pullback dips near 11:50, 12:40, and 13:20. If a MoonTide turn coincides with one of these, and the forecast shows a good following move, you can enter when the 20 EXMA starts pulling away from the 110 EXMA. These "trend continuation" trades often work well if supported by a good forecast. Now looks carefully at the two EXMA's between 14:00 and 15:00. For your convenience, the chart is repeated below. Near 14:08, the 20 EXMA broke above the 110 EXMA. One might think that this would be a buy signal. But the blue 110 EXMA remained flat. Now get this. This is important. It takes a crossing by the 20 EXMA and a "curl" in the 110 EXMA to give a good buy or sell signal. And it should be near a MoonTide turn. Near 14:18, the 20 EXMA dropped back below the 110 EXMA. The effect on the blue 110 EXMA was slight, and it was not near a MoonTide turn, so it was not a good sell signal. Then near 14:40, the yellow 20 EXMA broke the 110, which curled up, right at the MoonTide turn. We jumped on that one with both feet. We could see that the move should last until the close, and had the potential of running 9 or so points. Those are the highest potential trades. Notice one more thing-the angle of separation between the two averages. On a well scaled chart (like the ones on this site) that angle is about 20 degrees if it is a chaotic "streak" move. When you see that angle develop and you are in with the market, you know that the trading gods are with you. And that's what trading the MoonTides is all about. The process is not hard. Get a forecast. See where it says the good turns are. Going into the turns, track the forecast. When everything sets up right, take the trade. Use a close stop. Over time you will catch some small gains, some small losses, and some big gains - like this one. The secret is that you never take a big loss. And the MoonTides put the odds of catching a few big gains in your favor. This tutorial continues with several examples of actual trading using the MoonTides and the tracking indicators. Subscribers to this site get a nightly email with the next day's MoonTide forecast, a recommended 1ADay trade, and other trading suggestions. Then during the day, they can check this site and see how the Tides are working out and what the tracking indicators are showing. If you want to subscribe to the hotline, and gain daily access to this site, you can do so by going to the MoneyTide.com order form, and ordering Tomorrow's Market Email. Note that there are no live comments except on Fridays, although I may join the chat room.